As readers are no doubt aware, last week BBC Trending put out a video report on the use of misleading pictures on Twitter under the hashtag GazaUnderFire, mostly by people outside the Gaza Strip. That report – which appeared on the BBC News website – was an offshoot of a radio programme on the same topic which we discussed here. However, neither BBC Trending nor any other department has shown any interest whatsoever in the topic of the use of conventional and social media by Hamas for propaganda purposes – despite the fact that there are numerous recent examples. That lack of interest appears to have caused the BBC to fail to notice that it has itself been co-opted to Hamas propaganda. A picture circulated by Hamas purporting to show a teenager in Gaza killed by an Israeli airstrike is in fact a still image from the Hollywood horror film ‘Final Destination 4’, as can be seen in this video below. 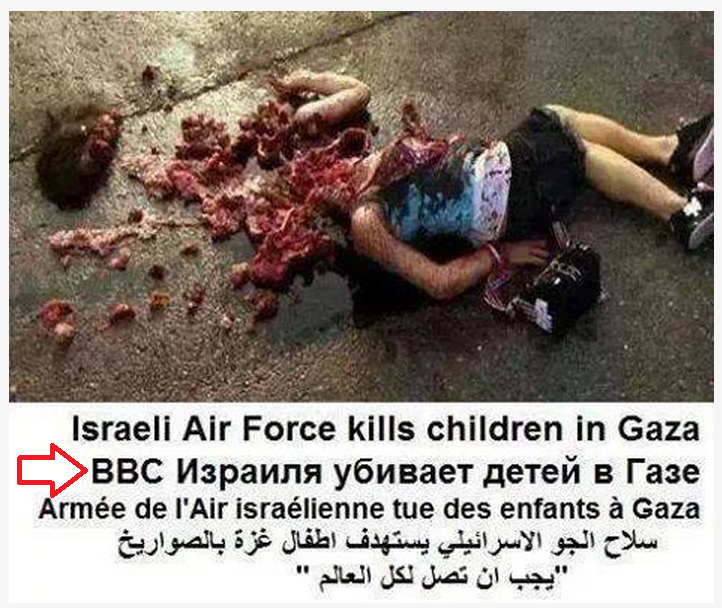 Note the caption in Russian inserted by Hamas: it reads “BBC Israel kills Palestinian teens in Gaza”. Now there’s a story for BBC Trending. At least three Jews were taken to hospital as a result of the clashes the erupted on Sunday between the protesters and young Jewish men who guarded the Synagogue de la Roquette in Paris, a witness told JTA. The attack at the Synagogue de la Roquette came on the heels of several anti-Semitic incidents that coincided with Israel’s offensive in Gaza, which began on July 8. In one attack in Belleville north of the French capital, a firebomb was hurled at a synagogue, causing minor damage. In another attack, a man sprayed pepper spray on the face of a 17-year-old girl. Although this propaganda attempt is ridiculous and horrific at the same time, it’s better to be accurate – the writing beneath the picture is in Russian, and it says “ВВС Израиля убивает детей в Газе” – which means: Israeli Air Force killing children at Gaza. The obreviature BBC, in Russian means Air Force, and it’s similarity to the channels name is confusing for non-russian readers..